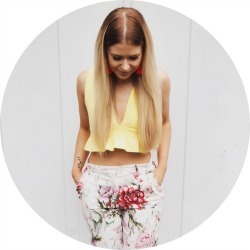 With the likes of Estee Lauder, NARS and Bobbi Brown now knocking around my makeup bag, it’s easy to start feeling like a bit of a fancy Nancy and to forget my beauty roots. 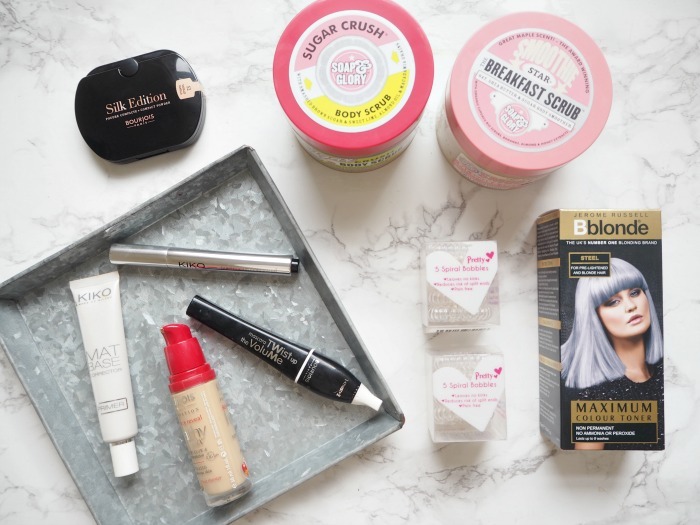 After all, I’m a drugstore girl at heart; so to remind myself of just how good drugstore makeup can be, I’ve actively decided to show Boots and Superdrug some love over the last month. None of these products cost more than £10, and a lot were bought with an offer too. First up, some new products I picked up were from a brand I haven’t tried before: Kiko. I was in Merry Hill shopping centre and they had a whole Kiko store (as I know the Bullring do too), and I instantly fell in love with the range of products and the good prices. 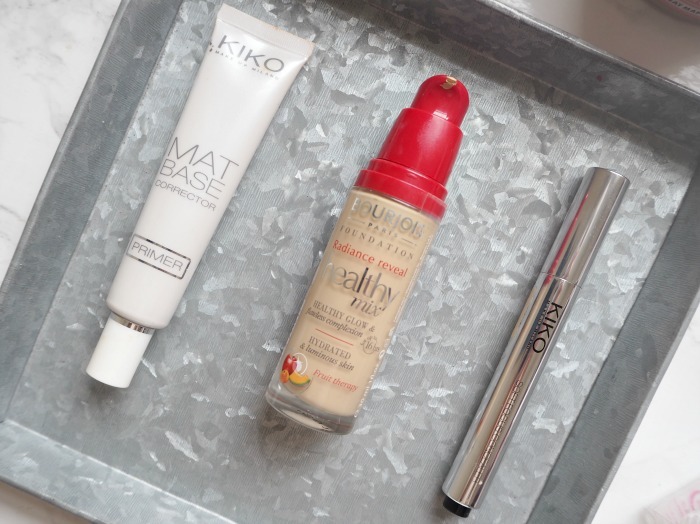 I decided to try out their Kiko Mat Base Corrector Primer and the Kiko Soft Focus Concealer, and will have some reviews of these coming soon. Next was a trip to trusty Boots and I had to stock up on some of my favourite Soap and Glory shower products, namely the Sugar Crush Body Wash, Sugar Crush Body Scrub, and The Smoothie Star Breakfast Scrub. Now these aren’t exactly cheapy-cheap at £6.50 for the wash and £8 each for the scrubs, but they were on 3 for 2. Plus they smell really good. REALLY. GOOD. 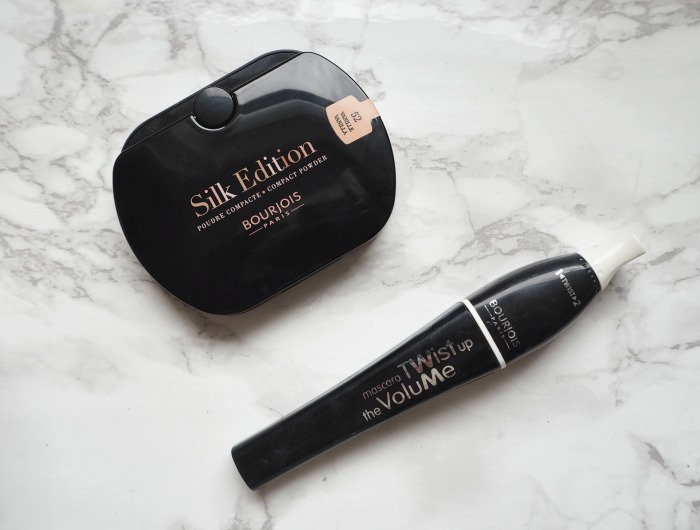 Another 3 for 2 offer was to be found at the Bourjois stand this month, and as I finally decided to try out the Bourjois Healthy Mix Foundation and re-purchase my much-loved Twist Up the Volume Mascara, I also got the Silk Edition Compact Powder for free. Finally, I swung by the castle of bargains that is Bodycare. 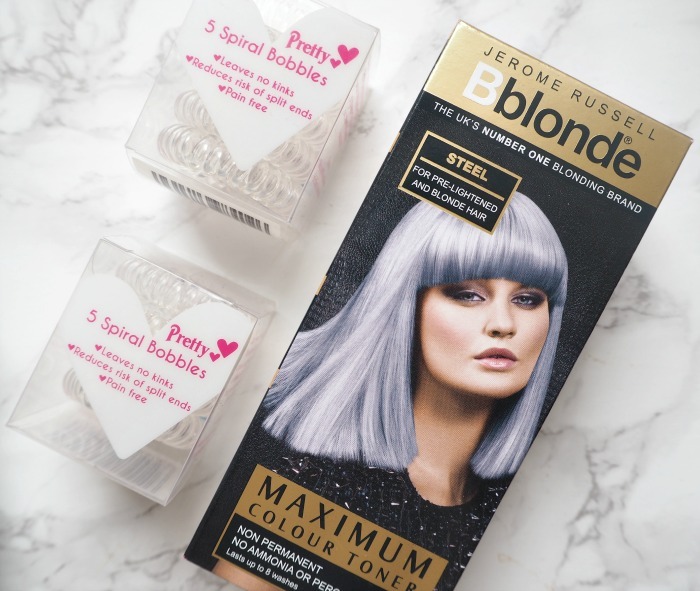 I stocked up on some of the Bblonde Maximum Colour Toner in Steel – regular readers will know I’m very loyal to the Silver Toner from the brand, but I couldn’t resist trying out this new, more blue-toned shade – along with some of those no-kink Spiral Bobbles. I hadn’t tried any of these before and wasn’t expecting much, but OH MY LAWD, how have I lived without them? My hair is notoriously bad for kinking (sometimes just holding it the wrong way will make it have a complete hissy fit and go the wrong way all day) but with these I can tie it up all night and my hair will hardly be any different in the morning. As they were only £1 for a pack of 5, I’ll definitely be stocking up on even more of these as essentials. So my love for the UK highstreet is well and truly reignited. In fact, since taking these photos last week (hence why I’m calling this a March haul) I’ve actually bought a whole other load of things from Boots. Oops. What are your favourite drugstore / highstreet beauty products? Let me know in the comments! I wish they sold those hair colors here in CZ. We have such a poor selection of colors. Everyone here just wants to be blonde (blah!). Love those hair ties. Love these beauty products! Thanks for sharing! The steel hair toner looks absolutely beautiful & so unique too! I really would of loved to have tried that out when I had blonde hair! & I agree, the Soap & Glory scrubs really do smell delicious! The packaging of this Bourjois powder is so cute. I need to give it a try. Love Bourjois mascara. I don’t use this hair toner before but reading your review I want to try. the soap&glory breakfast scrub is my favorite. the scent is heavenly. I’ve often wonder what’s the differences between Healthy Mix and healthy Mix Serum? Do you have both and can you make a comparison post? 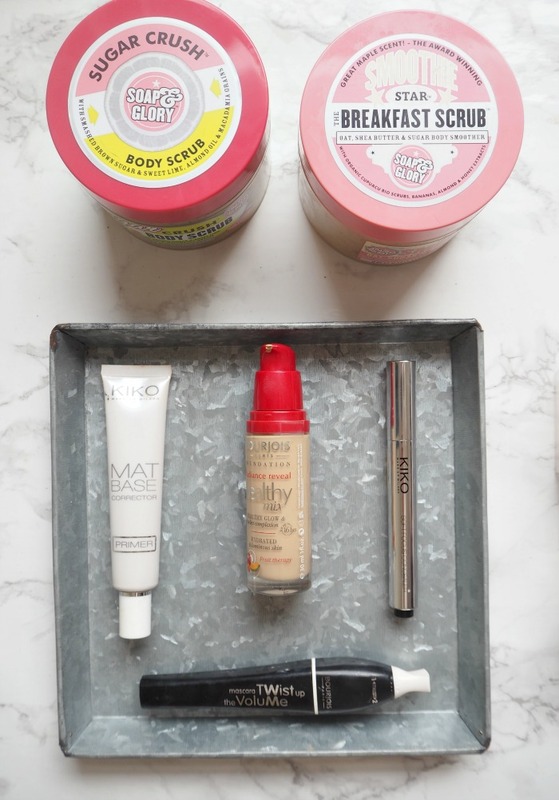 Love the look of the products especially the Soap & Glory. I wish Bourjois was easier to come by in the US! I always see so many people raving about their products! My fave drugstore brand so far is Maybelline. I love their mascaras! I am more into drugstore brands than high end beauty products, to be honest. I keep meaning to get invisible bobbles but forget, I’m fed up of my hair being ripped out so think I’ll have to stock up soon. Great picks! Those Spiral Bobbles sound really good I’m defo going to get some, I tie my hair up for all of 5 mins whilst I cleanse, tone and moisturise and the kinks are so annoying. 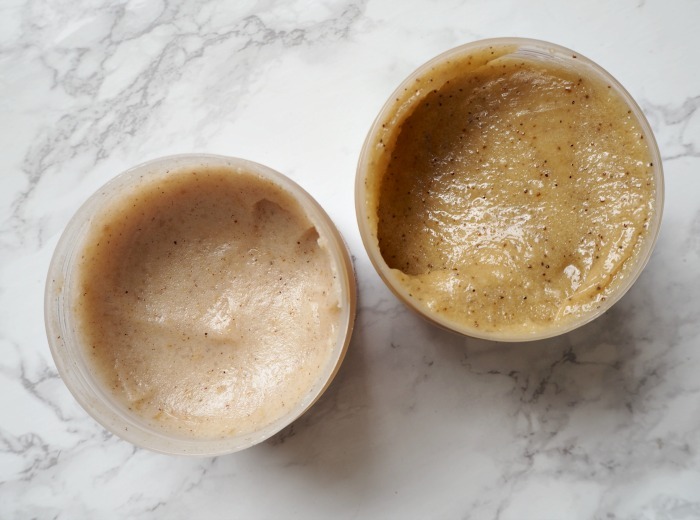 I love the The Smoothie Star Breakfast Scrub and your right its not cheap but it does last a good while.